Amish Tripathi is an Indian writer whose first novel “The immortals of Meluha” is one of the best selling books of Indian publication history.Here are some facts related to Amish Tripathi's life. Amish Tripathi was born in Mumbai on 18 October, 1974. Amish Tripathi has a daughter Neel and wife Preeti. Amish Tripathi has collected his management degree from the Indian Institute of Management Calcutta. Amish Tripathi always wanted to be an historian. But due to high expenses in that profession he did not choose it. Before becoming a novelist he has worked 14 years in the financial services. His first book “The immortals of Meluha” was first published on February 2010.His second novel “The secret of the nagas” was published on 12 August 2011. The third book ‘The Oath of the Vayuputras’ is to be released soon. Two million copies of his first two books were sold in the two year span. 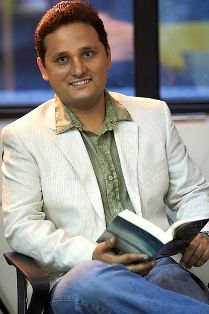 Amish Tripathi in his personal life is a devoted worshiper of god Shiva. He also believes that the huge success of his books is the blessings of Shiva. The three books are based on the re-imagined life and adventure of Shiva. The grandfather of Amish Tripathi is a Pandit from Benares and scholar in Sanskrit. Novels: "The immortals of Meluha","The secret of the nagas","The Oath of the Vayuputras"